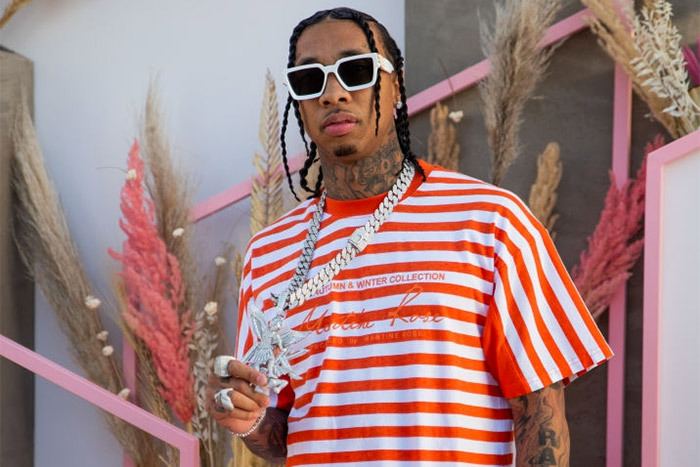 The rapper dropped a whopping $500,000 on his latest accessory, an Archangel chain featuring St. Michael trampling on Satan. According to TMZ, the 18k white gold piece weighs a little over 4 pounds and was designed by Ben Baller and IF & Co. Custom Jewelry. St. Michael’s halo is crafted from pear-shaped solitaire VVS clarity diamonds, while baguettes were added to the sword and feathers on his wings. The one–a-kind Cuban link necklace includes two different sized diamonds with a pavé set border. The chain is symbolic to Tyga. “The devil being stepped on represents satan aka the haters have been defeated and also specifies that @tyga had the biggest comeback 2018,” explained jeweler Ben Baller. Tyga’s comeback continues. On Monday, he dropped his new single “Goddamn,” and can be seen rocking his chain on the song’s cover art. The accessory was also on display during his performance at REVOLVE Festival in La Quinta, Calif. over the weekend. In addition to spending half a million on himself, Tyga is icing out his crew. He purchased 10 smaller versions the chain for his squad.